Is your desktop look like a forest with files and application shortcuts, you want a clean desktop without deleting these files? 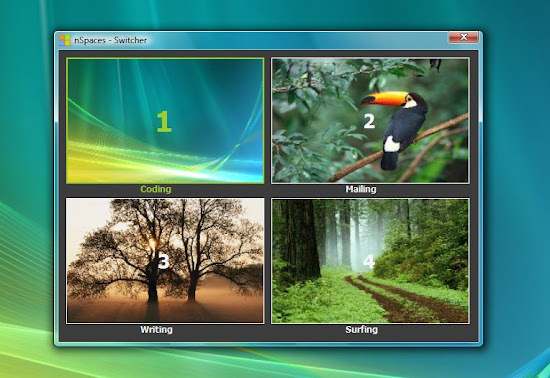 Then better is to try nSpaces multiple desktops, it is a new freeware tool for Windows 7 which allows you to create multiple desktops on your Windows 7. This application helps you to create different desktops for different works. User can categorize his activities and distribute them among the different workspaces available. You can add multiple rows and columns to the initial ones based on your requirements. For example, you can create a desktop for emailing with Outlook or similar application open, another one for browsers, third one for handling files and so on. In this way you can have better control of your desktop. 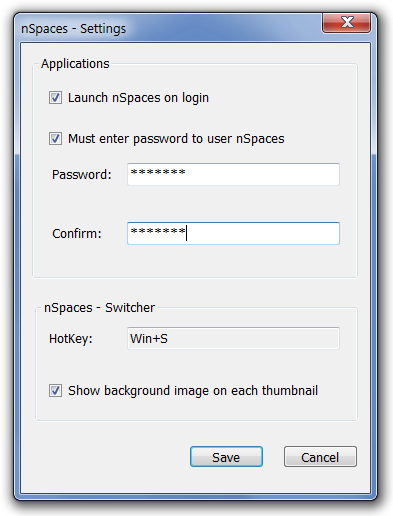 nSpaces is capable of keeping the items launched on a desktop separate from the other workspaces. The only elements common to all environments were the items on the original desktop. You can also set the hotkeys for switching desktops. You can also set a password for changing the desktops which is prompted when you switch them. Launch Desktops: Create multiple desktops on your computer. 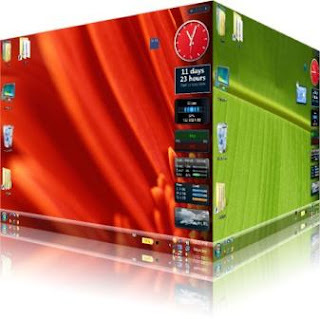 Launch Apps: Open different applications on each separate virtual desktops to improve your productivity. Name your space: label your tag for each virtual desktop, the tag is shown on the space switcher. Change wallpaper: Your desktop is unique, Set a custom desktop image for each of your desktops and watch as the pictures fade into each other when switching between your desktops. Color your space: If you don’t like to set a custom image for each desktop, just set a background color for them. Protect your space: If you don’t like anonymous users to use your spaces, just set a password for them. Hotkeys for everything: nSpaces has a group of hotkeys for each desktop you created, hotkey for the space switcher. You can change whatever you want. Since the application is on its initial stage, so it got many bugs and crashes and anyhow works its best to create Winmultiple desktops on Windows 7.